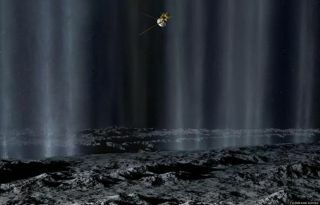 In this artist's concept, the Cassini spacecraft makes a close pass by Saturn's inner moon Enceladus to study plumes from geysers that erupt from giant fissures in the moon's southern polar region. A NASA spacecraft is set to make the closest flyby yet ofan icy moon of Saturn on Thursday. The Cassini probe is poised for a return plunge through thecoldshower plume of the Saturnian moon Enceladus on Oct. 9, and can expectanother icy reception for a following flyby on Oct. 31 in an attempt to uncoverpossible changes inside the frigid satellite. "The October doubleheader gives Cassini two moreopportunities to hit the ball out of the park," said Bob Pappalardo,Cassini project scientist at NASA's Jet Propulsion Laboratory in Pasadena,Calif. "With high scores in geology, surface heat, watery plumes andmagnetospheric effects, Enceladus could win the 'world championship' title thisyear!" Scientists expect Cassini to pass just 16 miles (25 km)above the moon's surface during the closest approach at 4:30 p.m. EDT (2030GMT). The probe's cruising speed should hit 39,594 mph (63,720 kph). Cassini is currently on a $160-million, two-yearextended tour of Saturn and its moons following the completion of its mainfour-year mission on June 30. Scientists took the opportunity to schedule sevenflybys of Enceladus, where they have debated the existenceof an ocean of water beneath the moon's frozen shell. Previous visits to Enceladus detected comet-like organicmolecules within the moon's icy, geyser-like jets. A more recent Aug. 11flyby pinpointed the locations of surfacefractures, nicknamed "tiger stripes," where those jets erupt outinto space. The upcoming October flybys may support findings from themost recent Enceladus flyby that suggest changes within the moon. Temperaturesover a surface fracture dubbed ?Damascus Sulcus? checked out at a chilly minus 171to minus 159 degrees Fahrenheit (160 to 167 Kelvin), well below the minus 136degrees Fahrenheit reported during a March flyby this year (180 Kelvin). "We don't know yet if this is due to a real coolingof this tiger stripe, or to the fact that we were looking much closer, at arelatively small area, and might have missed the warmest spot," said JohnSpencer, a Cassini scientist at the Southwest Research Institute in Boulder,Colo. Scientists should have another shot beyond this year witha second Enceladus doubleheader on Nov. 2 and Nov. 21 in 2009.